Topsify is a tool that you can use with Spotify to access the Top 40 playlists in the United States, the United Kingdom, and Sweden. Remember lying on the floor with the tape recorder on and the radio tuned to the Top 40 Countdown, only moving to press pause in order to cut out the ads and any pointless talk from the DJ. Or maybe you sat with pen and paper in hand and wrote down the songs and artists as they appeared on the countdown? You can forget about waiting around for the countdown or meticulously writing it down: You can access the Top 40 playlists in the U.S., the U.K., and Sweden straightaway with Topsify. There are also specialized playlists for American Top 40 R&B and hip-hop, and the Swedish Top 40 dance and club charts. Just visit Topsify to find links to the latest charts. 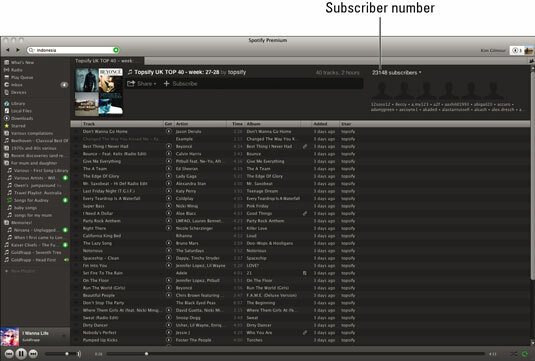 You can also subscribe to Topsify’s Spotify profile. That way, you can view the latest charts as soon as they’re updated (more than 23,000 people have already subscribed to the U.K. Top 40 link alone).